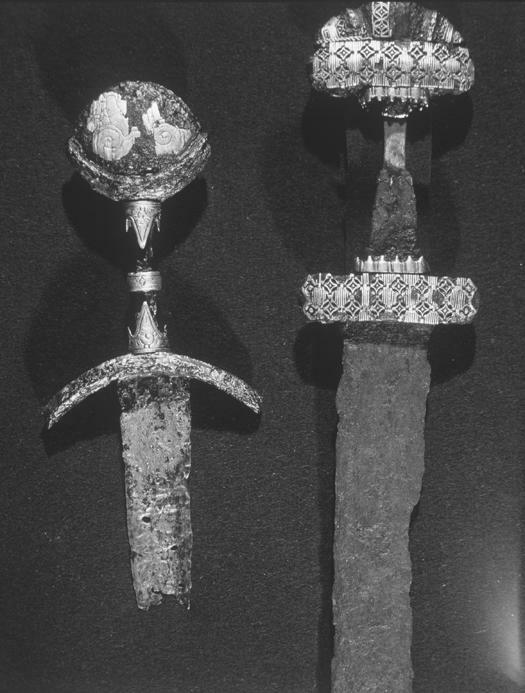 Posted: Sat 06 Jun, 2015 5:22 am Post subject: Late Germanic Iron Age "Prestige Swords", Denmark. The Late Germanic Iron Age (550-750 AD) is sadly a period with only a few good well preserved sword-finds in Denmark; compared to the bog-weapon finds from earlier in the Iron Age. Mostly graves are cremation graves and also that even in inhumation graves it was apparently not common to add grave goods. Sacrifice of enemy weapons also seems to cease. 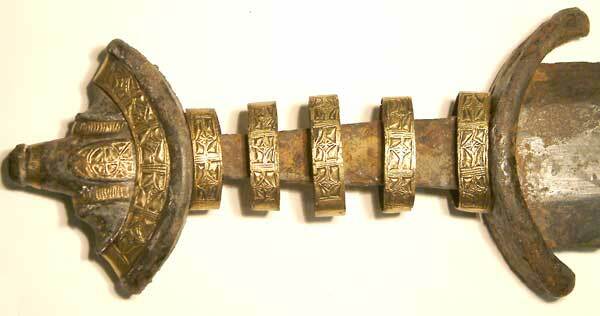 On Sjælland (Zealand) a grave from around ~650 AD have turned out a well preserved sword. The Kyndby grave site (North Zealand) was the burial of a rich man, a rich woman, and 6 poorer graves. So with all likelihood the household of husband and wife with retainers. The man was tall and between 20-40 years of age and buried with a sword, that was deliberately somewhat destroyed at the burial rites. The woman was buried with animal-fibulas and a big bronze jewelry piece and also had 70 glass-beads, 2 amethysts possibly from Italy and a small cylindrical bronze box with silver ornamentation. What is really special is that in all the graves at the site the diseased were buried with 1 big dog. A similar type of grave have been found at Elmelunde, Møn, where both sword, shield and the skeleton of a big dog was found. Haven't found any picture from that find yet. At Bildsø in Western Zealand a stray sword find dated around 650-700 AD was found in 1866 when digging up the old drained lakebed. It was not deliberately destroyed before deposition in the lake, so likely a offering. Sadly haven't been able to find picture of the full length of the sword, not any measurements. So we see a development from a short seax from 550 AD, towards longer and longer seaxes complementing the swords until they take over totally as the reserve weapon to the spear in 750 AD. Also note the changes in spear-heads and shield-bosses! 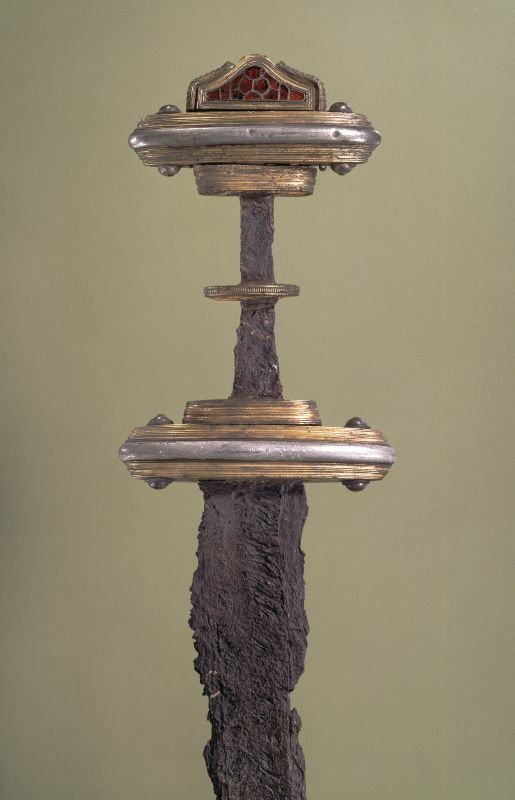 Older image of the Kyndby sword showing more of the blade and from the other side, than the picture above. Ornamentation is with gold and silver inlay by the way. It is obviously a "ring-sword" as you also have great examples from Sweden and England. 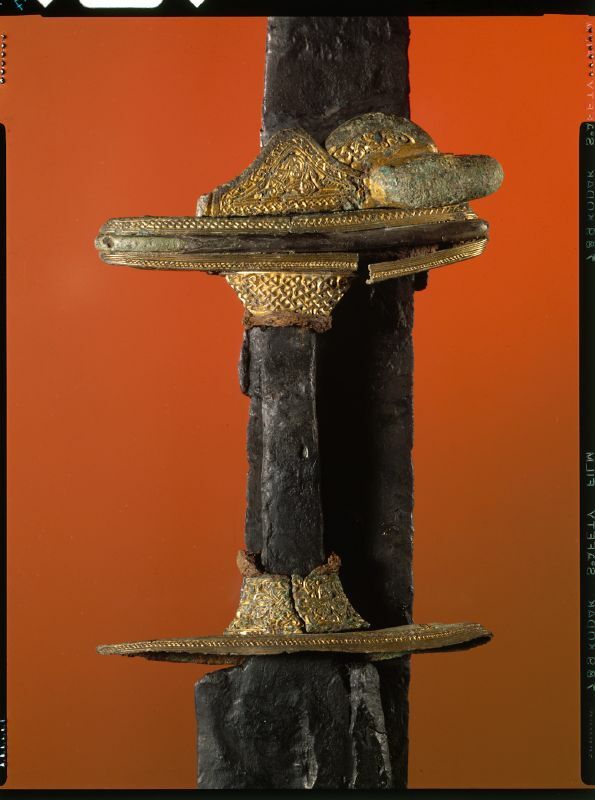 Notice that the Bildsø sword has the ring now located in the middle of the grip, instead at the top (as the Kyndby sword). Purpose of the ring is the oath the retainer takes to his Chief/King - to give his life - and the King then supply gifts, free food and drink at his table for his sworn men. So that's a long seax, but not sword, in the last drawing, right Niels? Yeah it's a one-edged weapon around 1 meter long, that became a standard of the period. Found another debatable Late Germanic Iron Age sword with the ring located in the middle of the handle. It's finding place is unknown, but is likely from Egå-area, North of Århus, Denmark and was described already in 1815 as being part of Bishop Birch's collection. But can this really be from the Germanic Iron Age?. Use of the ring says yes [placed on the grip like the Bildsø sword, perhaps ~700 AD], but the guard seems to be normally associated with the Petersen Type L, that you would expect to be from the viking age [850-950 AD]. Yet the pommel is totally not like a type L - in fact I can't really place it to any type. Sadly the blade is fragmentary, but the hilt and pommel (and ring) are fairly well preserved and shows silver covering on parts of the grip!! Maybe a sword that shows both new and archaic features at the same time, so perhaps a dating of 750-800 AD or a later Viking Sword with the archaic ring-feature (yet still strange pommel)? You've been posting some fantastic stuff lately Niels!!! The last sword is a strange one. I'm posting a bigger picture of it. I think it's later with an archaic design, but I'm no expert. Either way, it's a very cool sword. Too bad most of the silver plating is gone... It must have been a real beauty when it was new!!! Where on Earth did you find that picture you attached??? Much better view, Yeah it looks stunning and very unique. The sword on the right is by the way from the dried up lake at Sørup near Løgstør in northern Jutland. Somewhat fragmentary: 72 cm long. 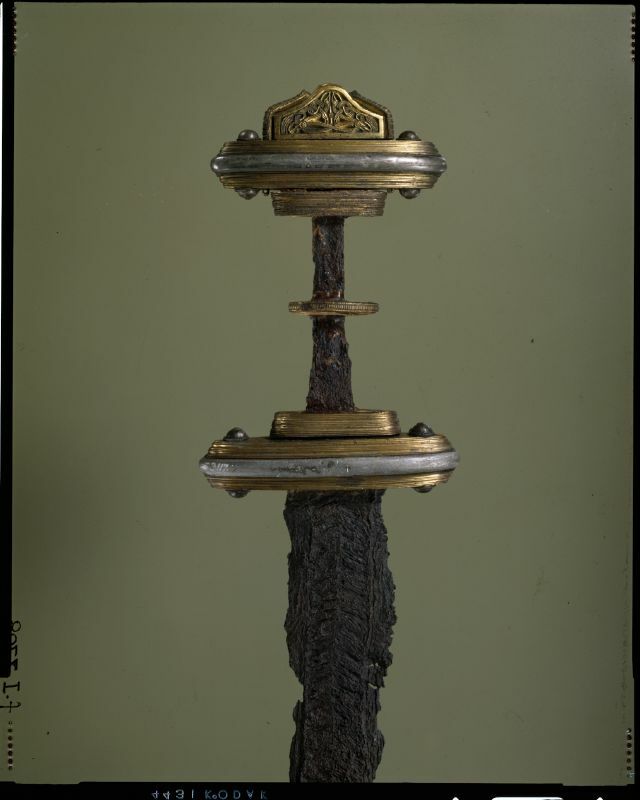 The only other Pedersen Type D sword I know from Denmark is also from Sørup, though confusing it is called the "Søndersø sword" and is at the National Museum in Copenhagen. [Maybe because the sword on the left is from Sørup - but Sørup, near Måløv on Zealand, not Jutland]. Found in 1873 (The Moesgård one was found in 1917 and the grip was damaged during this - damn). Sørup (Søndersø) Sword on the right. Where on Earth did you find that picture you attached??? Wow. That is fantastic. Looks way more impressive than I thought from the small picture I found. The pommel has a "semi-lunar base" (as Pedersen type L), but then you seem to have a "ball" resting on top of it. Such a shame not more of the silver ornamentation is there......(or what it is on the pommel). Agreed! It looks like the grip had some gold inlay too...I wonder if the pommel did as well and it's just missing. Such a cool piece! There are two swords of this unusual type in Oslo, both in equally poor condition unfortunately. Both are from the Telemark region of Norway. Petersen included the second one under type Z solely due to the curved guard, though it does seem more like a variant of type L to me also. This group is briefly discussed in Vera Evison's article "A sword from the Thames at Wallingford Bridge". She states that the type of silver ornament on the hilt dates to the 11th century. Offhand, I know of two examples of nearly identical ring ornaments on the hilt, both also from the 11th century. Definitely a closest fit in guard and pommel style with the two Norwegian ones! That is important to prove it's not a special unique example, but a "TYPE" found in two different locations. Really interesting with the grip decoration, that is somewhat the same between the Lough Derg and the Danish Egå sword, but the Danish sword is the only one of those you showed with a grip-ring [the small picture I added first really shows the somewhat “heightened" ring the best]. Ring on grip being Late Germanic Iron Age - perhaps even Early Viking Age - feature. Pedersen Type L swords “normally“ from 850-950 AD [but this specific pommel type of L could perhaps be later]. The Lough Derg sword grip-style from Late Viking Age to Early Middle Age (if it's dated correctly). So maybe a late Viking Sword with deliberate archaic features (perhaps given to an important man with antiquarian interests by Canute the Great - the ring certainly emphasize the old germanic ring oath between gift-receiving warrior and gift-giving King and the warrior pays with his life to protect the King). Found an L-type sword from England [Gilling West Sword] with 5 rings on the grip. It is dated to the 9th century. The rings looks “golden" to me on the picture, but does anyone know the material? So rings can in fact occur on Viking Age hilts [Bildsø sword was a stray find, so dating is not absolutely secure for it though it does look very Iron Age]. Though, it could be that these rings are part of a specific hilt fitting and not intended to be a "oath" rings. Another great thread Niels, probably my favorite of your recent posts. Thank you for sharing all the wonderful things from Denmark and Northern Europe. This sword is pretty interesting to me. People talk a lot about sword blades being handed down through the generations and receiving new pommels and guards and other fittings as the styles change. I've read this in a few of Oakshott's works for example, with a Landsknecht era fittings on a Viking era blade. Here perhaps the opposite could be true, some treasured fittings placed on a newer blade after the old one was worn out. Just a thought. When I first saw this one, I thought immediately of the Irish sword. Also nice to see a Baltic example. Perhaps they came from the same fitter. It belies the idea of local fittings, really. Thanks: I'll continue so long I find something interesting to show (and have the time). It's very possible this is the case here. The strange part is that the grip both shows the oldest and the newest features. Sadly we can't say much of the sword, but Pedersen L types pommels are approximate 850-950 AD, though this special pommel style might actually be later. The grip fittings are close in style, so it really seems to be the mark of a certain workshop. But where [Ireland, Denmark, Latvia] when you have three outspread examples! Going through old newspaper I found Worsaae's account in 1861 in "Illustreret Tidende" about an inhumation grave with two swords at *Magleø, Tårnborg Sogn (parish), Slagelse Herred (Shire), western Sjælland, Denmark, that he had excavated in 1860. One of these is depicted on the left and shows very nice decoration. Decorative metals: Silver + copper. There's a drawing of the beautiful Bildso sword on page 45 in the very old (1882) book by Worsaae, "Industrial Arts of Denmark". Very nice free book with other drawings of Iron Age finds, but this is the finest sword. I'd love to have a reproduction made someday. If you know of something more current than Worsaae's book, in English, about Danish finds, please let me know. Thanks - I didn't know that work was online. You are right about beautiful drawings. They really had some amazing artists (many scholars were excellent artists themselves). The Magleø sword I mentioned actually also appears in this publication on a drawing on page 74, figure 233 ! There is at least one example from Norway with very, very similar knot designs... I'm not sure how this type of decoration relates to the major Viking art styles since there doesn't seem to be any animal element to it. Both swords is at Nationalmuseet, but no other pictures are available. Yes the sword on the right in "Illustreret Tidende" is from Norway. I agree - I'm not confident in how you should label the ornamentation style either?! The important articles with weapons or military I have bolded. 2014 (3) the latest article. "Burgundian" hat from medieval Greenland! You have to be dapper even at the end of the world so much that it was used and repaired for at least 100 years a true heirloom . Chariot equipment from late bronze age found at Bækkedal. Pictures on the Greater Jeling stone. Biochemistry of the Nordic grog (if one is seriously into beverages). Weapons, fighters and combat: spears and swords in Early Bronze Age Scandinavia ! + 3 diskussion articles (!) about the unique Odin figurine found at Lejre. + Bronze age weapons and flint copies in Denmark [great drawings]. + Lærkefryd metal detector finds from the Iron age -> showing a battle axe head and a sword hilt. Hedegaard site [fantastic drawings of the saxes (page 65 + 71), spear-head (page 77) and the amazing unique roman pugio in LARGE detailed images (page 78-79) and a La Tene sword hilt (page 84) and the important mail fragments (page 86). This article should not be missed! Thats what I got around to check so far.